Despite a rebound in economic growth of 4.5% for the first half of the year, Guyana faces considerable economic and fiscal headwinds for 2018 that will mean restrictions in spending in the public sector. And the short term challenges are considerable. 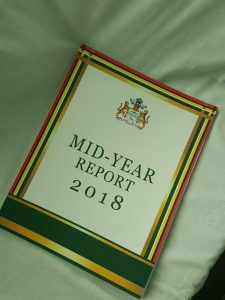 In his mid-year report to Parliament, Jordan noted that “higher than expected levels of rainfall and the impact of climate change continue to threaten economic activity across several sectors within the economy – sugar, rice, forestry, mining and construction, among others – which could constrain the overall growth performance for the year. In the case of gold, the price dipped on Tuesday morning to US$1,195.30 per oz amid worldwide economic uncertainties that has meant a strengthening of the US dollar. If this decline continues, government royalties will be affected. In addition the country’s biggest producer Guyana Goldfields has recently downgraded its output estimate for 2018 from a target of 200,000 oz to a range of 175,000 oz to 185,000 oz range due to technical issues at its Aurora mine. The mid year report notes that the expansion in the forestry industry was driven by the production of logs and roundwood, which increased by 24.8 percent and 46.6 percent, respectively. However Jordan warned “that the prolonged rainy season has resulted in a significant deterioration of hinterland roads and poses a risk to production.” In the rice sector prospects look better with an expected 88,600 hectares to be planted for the second crop, an increase of 7.8 percent, over the previous year. The overall fiscal outlook remains unclear: internal revenue collection did increase by $6.7 billion, reaching $48.3 billion, during the first half of 2018 but a portion of this was due to non recurring increased collections of arrears. On the spending side the government is obliged to pay the second tranche of severance payments to sugar workers by year end while also restructuring the industry. And the expansion of the public service payroll remains a cause of great concern. Jordan notes “With respect to employment costs, $27.6 billion, or 46.9 percent of the revised budget for this category, was spent, reflecting a $2.4 billion, or 9.5 percent, increase when compared to the same period for 2017. This increase can be partly attributed to new recruits.” The establishment and expansion of various agencies and departments is also being watched given the burden on government spending.